John Brown (1715–1766) was a clergyman who achieved great but transient fame as a writer and moralist. His attack on Shaftesbury and “moral sense” philosophy, against which he employed utilitarian arguments and also arguments deriving from God’s benevolent intentions toward his creation, was published in 1751 and was later praised by John Stuart Mill. 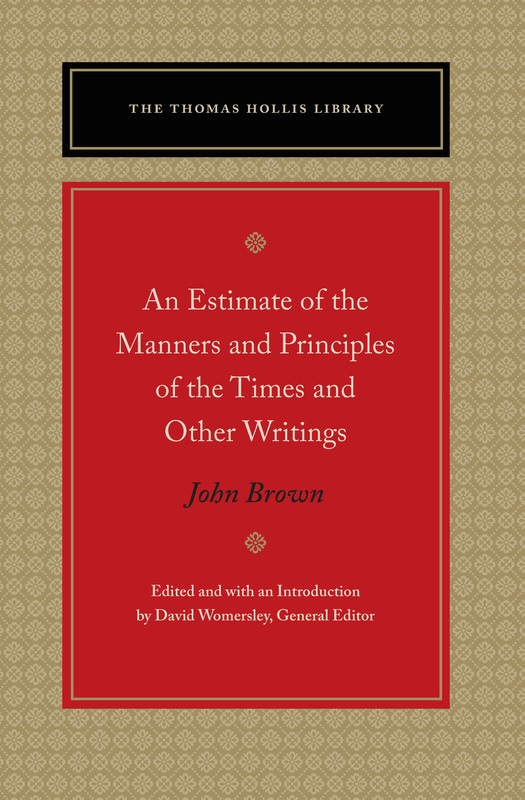 Alongside Estimate, the volume includes four other works by Brown: his poem On Liberty (1749); his Essays on the Characteristicks (1751), which is an attack on Shaftesbury’s Characteristicks; his Explanatory Defence of the Estimate (1758), in which Brown engaged to defend the work, to some modest extent, against his critics; and finally, a late work, Thoughts on Civil Liberty (1765). Two appendixes complement the texts: a brief tribute to Brown by Thomas Hollis (an Englishman who devoted his life to the cause of liberty and for whom this series is named), in which Hollis depicts Brown “as a weak man who nevertheless possessed a measure of virtue and talent, and who fell among thieves in the feral literary and political circles of Hanoverian England.” The second appendix provides Hollis’s own annotations to his copy of Estimate. The introduction, by David Womersley, places Brown’s writings and career in the context of eighteenth-century moralism and, naturally, in the tradition of British writing on liberty. The annotations will gloss now-unfamiliar words and explain now-obscure references to contemporary events, circumstances, and personalities. David Womersley is Thomas Warton Professor of English Literature at the University of Oxford. His most recent book is an edition of Jonathan Swift’s Gulliver’s Travels (2012). Editor's introduction, further reading, note on the texts, abbreviations, chronology of Brown's life, appendixes, index.